This publication is a summary of ideas and suggestions discussed at a workshop facilitated by The Nous Group. The participants were from throughout Australia and included technical experts, consumer representatives, government and people from bushfire affected regions. It is expected that this document will be provided as an input into the review of bushfire start minimisation being conducted by Energy Safety Victoria. This report has been compiled from data, information and opinions provided by many stakeholders for the sole purpose stated in the report. No warranty is provided or implied as to the accuracy or suitability of this information for any other purpose. Anyone seeking to take action or make decisions on matters associated with the issues covered here other than those specifically recommended in this report, should rely entirely on their own investigations. The report contains some direct quotes of statements made by other parties. Unless indicated otherwise, these quotes do not necessarily reflect the views of The Nous Group. protection and control The class of systems that detect network malfunctions and take automatic action to preserve safety and supply. They are also used by network operators to control the network. On Saturday 7 February 2009, the most devastating bushfires in Victoria's history caused catastrophic loss of life and public and private property in several areas of the State. The Victorian Government established the Victorian Bushfires Royal Commission (VBRC) on 16 February 2009 to investigate the causes and responses to the bushfires. It is focusing on 12 major fires of which electricity system assets may have started five1. The VBRC has heard evidence in relation to a number of matters relevant to the electricity safety regime. These include replacement of ageing electricity assets, the adequacy of inspection regimes (including training of asset inspectors and frequency of inspection), and the setting and operation of protection devices in periods of high fire risk. On 10 December 2009, the Victorian Government committed to hold a national workshop, with representatives from government, regulators (technical and economic), industry and consumer associations, and community representatives (including from bushfire affected communities) to facilitate consideration of the most effective way to supply electricity to rural areas of the state while cutting fire risk. The workshop was held in Melbourne on Wednesday 21 April 2010, attended by 41 participants. It was designed as a forum for participants to consider the benefits, disadvantages and costs of alternative electricity distribution technology in regional areas to reduce the fire risk in a way that is consistent with government policy objectives of safe, reliable, secure, affordable and sustainable energy supply. Consistent with statements made to the VBRC, it paid particular regard to the ageing of Single Wire Earth Return (SWER) lines and alternatives to SWER technology, as well as to steps required to implement recommendations made in submission of the Counsel Assisting the VBRC on systemic issues in electricity supply. To address its purpose, the workshop took a holistic view of fire risk management related to electricity supply to ensure all important contextual factors were taken into account. All options were considered using frameworks that ensured neutrality between network and non-network options and across all available network technologies. The Minister for Energy and Resources has recently asked Energy Safe Victoria (ESV) to undertake a strategic review of the short and long term options available to the industry and government to minimise bushfire starts related to electricity system assets. ESV will produce an interim report by 30 November 2010 and a final report by 1 November 2011. The ESV review will continue work that has been undertaken by the Victorian Government since the February 2009 bushfires. The national workshop is a key step to establish a sound basis for the ESV review. The focus areas to which effort should be directed in the short term for the best result. Workshop recommendations on frameworks are detailed in Section 2; those on processes are set out in Section 3; those on information are set out in Section 4; and recommended areas for short term focus are described in Section 5. A summary of the workshop recommendations is provided in Section 7. The workshop recommendations recognise the complexity of the issues involved, the incomplete state of reliable information required for final decisions on matters raised in the wake of the Black Saturday fires, and the consultation necessary to ensure decisions meet community expectations. 1 Around 600 fires started on the day, of which 10-20 may have been caused by electricity system assets. The 12 major fires under VBRC investigation include the Delburn fire which started in the week prior to Black Saturday. 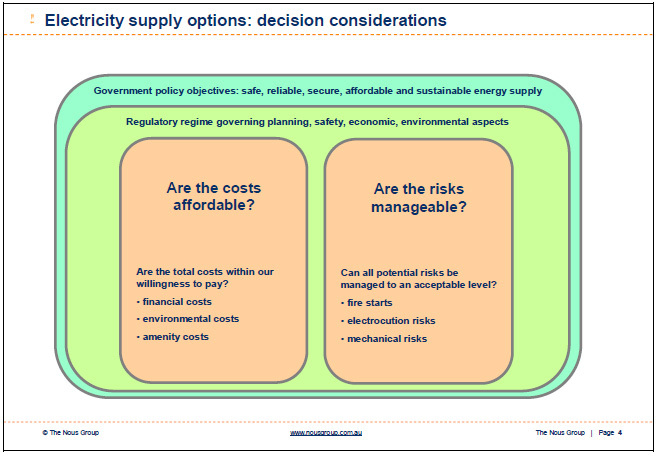 An end-to-end holistic view: consideration of options for electricity supply must be accompanied by consideration of options to reduce other fire causes and options to reduce fire consequences regardless of cause. Participants expressed some concern about focusing on the less than 4% of fires thought to have been started by electrical system assets on Black Saturday while ignoring the more than 96% of fires started from other causes. Participants also felt the focus on fire causes should not take away from the need to look at factors that influence the consequences of fires (particularly ground fuel load and resources for fighting fires). Effective community engagement: processes must ensure communities understand and can contribute to decisions that affect them. Community expectations will cover the effect of decisions on all aspects (safety, security, reliability, affordability and sustainability) of their electricity supply, as well as effects on other factors that may reduce fire consequences. Prior to the workshop, participants received a comprehensive information paper (Appendix C) setting out key contextual information and some preliminary analysis of the issues. Key elements of the paper were reviewed at the start of the workshop (Figure 1 to Figure 5). Participants agreed that although the contribution of electricity networks was a relatively small proportion of total fire starts and that many factors that influence fire consequences fall outside the scope of electricity businesses, the aspirational goal should still be a 'step change' reduction in fire risk from electricity networks. Participants agreed the goal is a holistic solution that balances outcomes in all key areas. Around 88% of rural 'bare wire' power lines are either SWER or 22kV single phase or three phase lines. Initial high level indicative estimates of replacement cost range from $12 billion to $20 billion (2009 dollars) with a further $8 billion if the remaining 12% (66kV or low voltage lines) is also replaced. 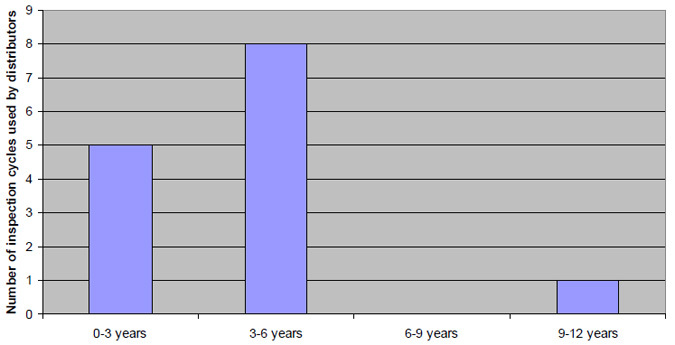 Options considered to date have the consequential effects on customer electricity accounts shown in Figure 5. Even under current arrangements, average distribution network services cost to customers can be expected to rise somewhat over the next two decades as older network assets are progressively replaced. 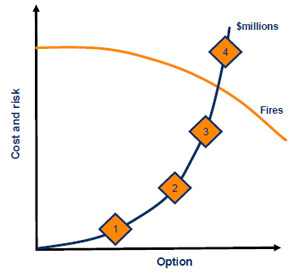 Action to cut fire risks by a move to different network technologies (insulated wire or underground) will add the cost of the initial change, plus the cost of later replacements at the end of each service life cycle – which are shorter for these technologies than for the ones used in existing networks. In the long term such action may add $500 to $800 to the average electricity account in territories supplied by distributors that own major rural networks. Affordability: Participants agreed costs can only be properly considered on a 'whole of life' basis and saw the potential effect on electricity accounts as a material consideration in decisions, given potential effects on vulnerable customers and regional economies. SWER technology: Participants also commented on VBRC submissions that appear to focus on fire risk from SWER networks, commenting that 'SWER is not a bad system – certainly no worse than other overhead lines and it even has some clear advantages for fire risk, e.g. no clashing and high clearances across wooded gullies'. Some felt that any perceptions of increased fire risk with SWER could be due to its presence in remote places where fires may not be quickly detected and where access by fire management vehicles to control fires may be difficult. Increased fire risk is not seen as inherent in the technology itself. Participants knew of no other jurisdiction where wide area replacement of SWER is being contemplated. Sustainability: Community representatives pointed out the impact of the Black Saturday fires on people's thinking about the future: 'a paradigm shift in rural community thinking is underway which can't yet be quantified or qualified as it will take a long period of time to complete'. Early indications are that a much greater emphasis on sustainability may emerge, with people concerned about 'what we will leave for our children and grandchildren'. 2 Estimates of cost and effects on customer accounts are in real 2009 dollars and are subject to qualifications and explanation set out in Appendix C.
3 Figure 5 shows only the portion of electricity accounts that pays for distribution network services. Some options are yet to be modelled, e.g. use of covered conductor (as distinct from ABC) on non-SWER lines. A comprehensive set of clear conceptual frameworks is required to support reliable analysis and the derivation of sound conclusions from consideration of the very complex array of factors involved in assessment of network options to cut fire risk. Indeed, these frameworks are essential for efficient delivery of targeted risk reductions. Strategic performance assessment framework to clearly understand the starting point and track long term improvements in network fire risk performance. Workshop participants recognise the need for a holistic4 approach, capability to deal with non-linear decision flow5 and flexibility to accommodate emerging insights. The frameworks considered by the workshop are seen as a valid starting point and they can be expected to evolve and develop further as objectives are clarified and new insights and information emerges. They also recognise that whilst the frameworks set out here are a valuable aid to clear thinking and sound decisions spanning a very complex set of issues, the optimum outcome is likely to be a multi-faceted action plan comprising a mix of options carefully chosen using the frameworks and decision logic. The frameworks outlined here must also be aligned with analytic frameworks used by fire services and emergency management strategists, so a coherent set of agreed assumptions underpins them all. The following sections describe each framework in more detail. 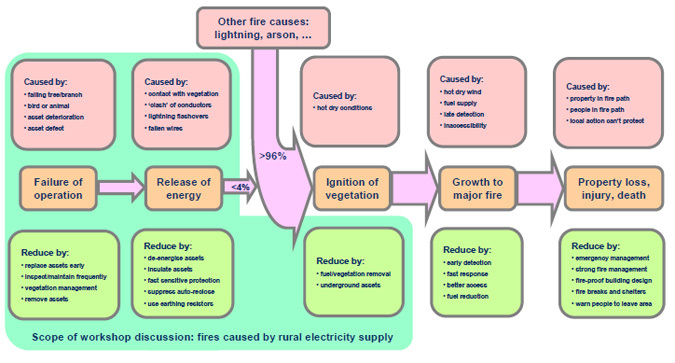 The causation chain framework for catastrophic loss from a fire started at an electricity asset is set out in the information paper and shown here in Figure 6. Participants viewed this framework as a valuable aid to understanding, analysis and communication of issues, both across the areas of expertise involved and to the wider non-expert stakeholder community. Discussion identified enhancements to the framework to further increase its value in decision making and stakeholder engagement. These are described below. 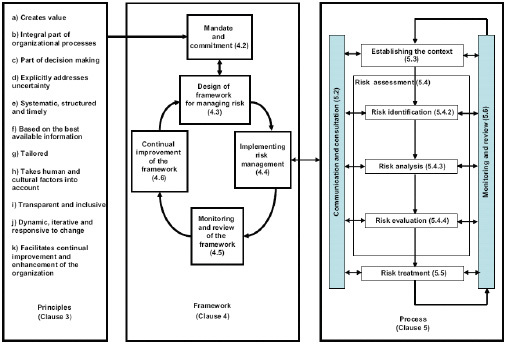 Firstly, to ensure a holistic approach to risk minimisation the causation chain must be expressed as a coherent part of a broader 'global' risk management approach based on AS/NZS/ISO 31000:2009 (Figure 7) so electricity related risks are not treated separately or in isolation from other factors in the overall bushfire risk management challenge. 4 i.e. including flow-on effects such as the impact of higher electricity prices on regional economies. 5 There may not be a linear upgrade/ replace/remove progression through options; decisions may branch at any stage to non-network solutions or to options that address elements further along the causation chain, e.g. earlier detection, fast response. Secondly, the causation chain framework must be extended to provide further detail and explanation of options at each potential intervention point along the chain. This will reduce potential for miscommunication. An initial elaboration of options is set out in Table 1. These are subject to further development and refinement as work proceeds. Thirdly, for completeness and to aid holistic analysis, the causation chain framework must be extended to show the potential contribution of key pre-conditions as well as the downstream effects of intervention options. An initial list of pre-conditions is set out in Table 2. These are subject to further development and refinement as work proceeds. 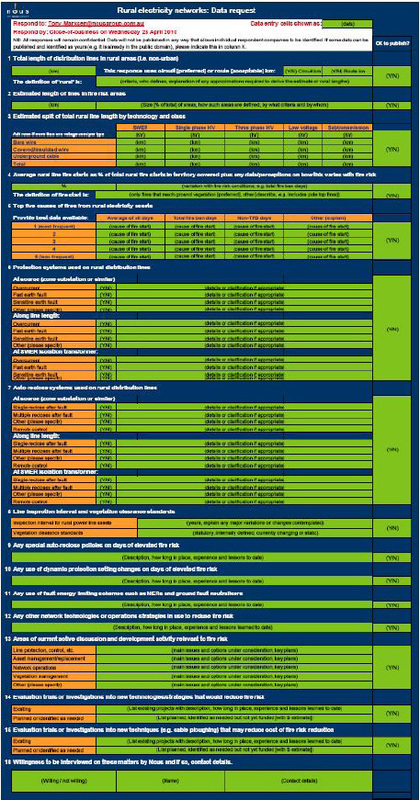 7 Trees are the single biggest cause (24%) of 'electricity network' fires on total fire ban days (see Table 9 of Appendix C). A suggested initial list of potential downstream effects is set out in Table 3. These are subject to further development and refinement as work proceeds. Fourthly, the causation chain framework will be more powerful with input/output ratios at each potential intervention point (rather than just the 4% to 96% ratio between fires started by electricity assets and those started by other causes). Inclusion of additional key measures such as those listed in Table 4 will add valuable 'fault-tree' functionality to the framework. With the above enhancements, participants felt the causation chain framework will be a key enabler of sound thinking by its organisation of all the diverse complex issues involved in the fire risk management challenge. 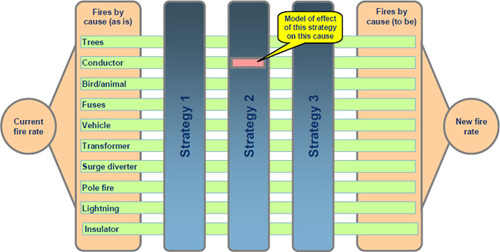 The ratios between the input and output measures listed in Table 4 above can be used as measures of the effect of intervention strategy at each point in the causation chain. Whilst these measures would exhibit some short term volatility (season-to-season fluctuation) and vary by location, they are potentially well suited for long term tracking of performance trends to drive future progressive reduction of fire risk from rural electricity networks. An initial comprehensive assessment of the current state is required to establish a well defined baseline from which future improvement can be measured. This will also provide stakeholders and decision makers with valuable perspective and will answer many questions likely to arise in community engagement processes. Participants felt the initial assessment set out in the information paper is a good start and one which illustrates the high value of a thorough current state assessment. 8 This measure may require refinement to reflect the key factors that may lead to ignition, e.g. intensity and duration of energy release. See also footnote 13 on page 25. Two decision logic flow charts were developed for the information paper and are shown here in Figure 8 for 'green field' applications and Figure 9 for 'brown field' applications (refer Appendix C for a full explanation). Each can lead to selection of a network or a non-network (local generation) approach to reduction of fire risk from electricity supply assets and activities. 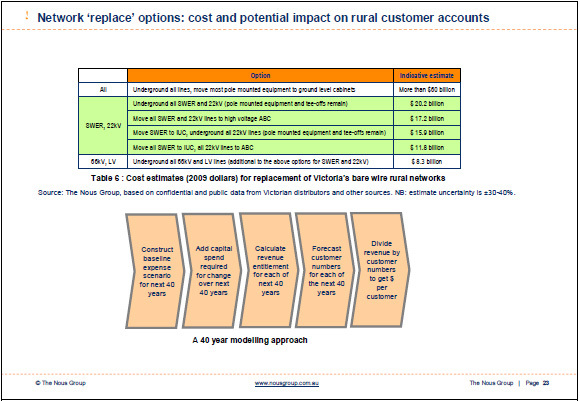 The 'green fields' options analysis framework has potential value for future network extensions. However, the 'brown fields' case is the more complex challenge, i.e. options to modify, upgrade or replace an existing network to reduce fire risk while preserving continuity of supply to customers supplied from it. 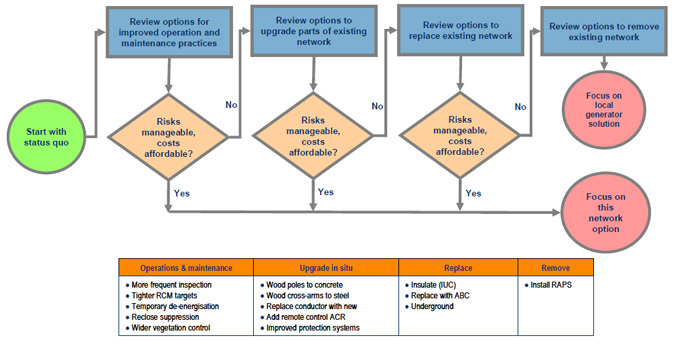 Participants felt the 'brown fields' options analysis framework shown in Figure 9 is a valuable aid for analysis of options to address the challenge of reducing fire risk from existing networks. However, participants pointed out that both these frameworks start by considering shared supply (network based) options and revert to non-network options only if a successful network solution cannot be identified. Both should be further enhanced to ensure complete neutrality between network and non-network options. This may also deliver a more efficient decision process in circumstances where non-network options have a compelling advantage, e.g. for small loads on the end of long power lines. Electricity assets have relatively long service lives, ranging from 20 to 80 years. Sound decisions on options must consider whole-of-life costs and benefits. However, over these time spans, circumstances can change profoundly which can affect the value of an option. With climate change for example, decisions on network replacement options must consider the possibility that some existing settlements may become uninhabitable without major forest clearing around them. Alternatively, the make up of native forests themselves may change markedly over the next few decades if bushfire frequency increases. Participants pointed out that history may not be a good guide to future risk in these circumstances. The objective of all scenario planning is to assess whether strategy options will remain valid and viable across the range of possible long term futures. 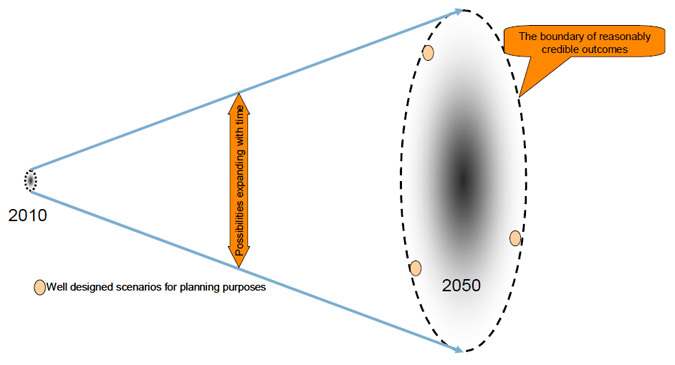 To do this, scenarios are chosen that map the 'boundary of reasonably credible long term futures as shown in Figure 11. The factors likely to be important in assessment of fire risk management options include changes in land use, weather patterns (including occurrence of extreme weather events), changes in geographic distribution of population and demographics, as well as potential new technology developments. The assessment of options to reduce bushfire risk must include testing of at least short listed options against suitably designed long term scenarios to confirm their value and effectiveness over the full service life of the assets involved. It is most unlikely a single option will suit every location in Victoria equally. Victoria should be mapped by risk, priority and common elements, to indicate zones where results of analysis are likely to be the same, and to identify priority locations for early action. This approach is already used in a number of strategic decision making processes, including fire management. Presence of property and people potentially at risk when major fires occur – this could draw on recent work by the Victorian Government to identify 'at-risk' communities for special attention. Comparative sparsity of electricity customers, e.g. average customer load per square kilometre. The maps will aid quick identification of short listed solutions suited to particular communities. They will help identify where an option for one area may reduce risk in another area. 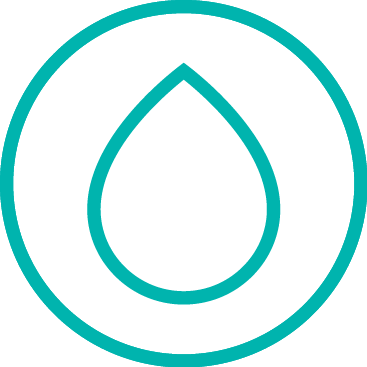 They will also reveal the existence of particular areas that require unique solutions that may not benefit from economies of scale. In essence, specific geographic zones may be identified that require particular classes or types of risk treatment because of the local risk environment. For successful change, the process of analysis and decision making must meet clear criteria especially those essential to good community engagement. Whilst rigorous expert analysis of options remains essential, the most cost-effective outcome will be delivered when decisions take into account community and consumer views and indeed, are shaped by them. Successful implementation of any change will rely on the good will of the local community. If local communities are not satisfied with decisions that do not meet their expectations, they can effectively impede change through, for example, use of local planning provisions and the requirements for approval of Cultural Heritage Management Plans and similar instruments. We must more clearly understand the community's expectations of the outcome this work should achieve. These expectations are likely to span the full range of objectives of energy supply – safety, security, reliability, affordability and sustainability – and may include willingness to trade off one objective against another. They may also include other considerations such as visual amenity as a differentiator between different risk reduction options. Additionally, consumer representatives stated that affordability of electricity is an important factor in regional economies and for vulnerable customers. Whilst there appears to be a general expectation that local communities are seeking to reduce the number of fires starts from electricity system assets, they may not distinguish between different fire causes and may be expecting changes elsewhere, e.g. reduction of fuel load levels and investment to improve fire agencies response capability. 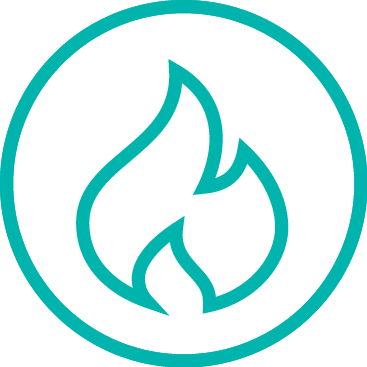 The community may seek a lower cost option such as better information on fire starts near electricity assets, rather than a higher cost option like full or partial network replacement. Expectations may also vary from community to community and it will be important to understand the circumstances of each and every rural community in Victoria. There may be no 'one size fits all' solution, meaning any selected solution must be tailored to the needs and expectations of each local community. The best possible community engagement approach should be used to complement rigorous expert analysis in decisions on outcome targets and to identify and address success factors for change. Critical success factors for community engagement include respect, transparency, early involvement, strong ethics and a clear outcomes focus (i.e. not consultation for consultation's sake). The representative from the Marysville and Triangle Development Group (MATDG) pointed to international material on core values for public participation as a potentially useful guide (see Appendix D). It is almost impossible to gain community interest unless there is engagement – the challenge is to clearly articulate how the issues affect them. Communities will primarily seek to understand why decisions have been made and how the decisions were made. Participants representing community and consumer interests suggested the most effective way to engage with each community is to integrate with their existing processes, such as meetings of school groups, sporting clubs and churches. Meetings should be at their premises, and it should be clearly articulated whether the purpose of the meeting is for consultation or information sharing. Relationships with key stakeholders and community leaders must be built so that they champion the discussion and radiate the message through the community, rather than attempting a top down approach. We could also usefully learn from (and possibly leverage) other recent engagement processes, e.g. the integrated fire planning approach, and successful models in the water, health and transport sectors. There must be a three way (regulators, distributors, community) engagement process. Some participants stated they did not view current formal regulatory consultation processes as adequately meeting this criterion. Participants expressed the view that some sectors of the community engage to some extent with the economic regulator (AER) in its consideration of the electricity distributors' revenue requirement, but not much at all with the safety and technical regulator (ESV). An understanding of the community's expectations is vital to the safety and technical regulator as it informs regulatory judgement on the level of safety risk that can be considered to be "as low as reasonably practical". The workshop noted that consultation will be enhanced soon with the publication of a proposed new ESV annual report on electricity distributors' safety compliance. There is currently a three way interaction between the economic regulator, safety and technical regulator and electricity distributors. This interaction will also be enhanced following the recent signing of a Memorandum of Understanding by the AER and ESV. Some participants stated a view that the VBRC uses legal processes that perhaps may not deliver the best policy outcome to meet community expectations. They suggested this current project should link with other parts of Government to ensure there is appropriate prioritisation of actions that address both the different causes of fires and the consequences of fires in a way that achieves the best overall result. The extent to which current regulatory arrangements provide investor certainty (essential for the funding of any change) must also be considered and options for change explored if necessary. There are three inter-linked core considerations here: investor certainty, accountability for delivery, and flexibility to adapt as better solutions emerge. During the workshop there was discussion as to whether current regulatory arrangements provide sufficient investor certainty (clarity on cost recovery) for the funding of any options to reduce the risk of fires started by electricity assets. The discussion indicated that some form of a Government mandate would ultimately be essential to provide the investor certainty necessary to raise funding to achieve a particular outcome. Without imposition of some form of a statutory obligation, the AER may not take into consideration any change that may be required to the business's approved revenue base -and even if it did, electricity distributors can still choose not to implement that change. With the transition to an outcomes based safety and regulatory regime, based on formal Electricity Safety Management Schemes, ESV could require an electricity distributor to undertake a risk assessment of a particular option, but only in exceptional cases would it be likely to formally require them to implement an option. If the Government did choose to mandate a particular outcome to provide investor certainty, the challenge will then be for this mandate to be sufficiently flexible to allow innovation and selection of lower cost options that may emerge over time to deliver the same outcome. The mandate would therefore need to be consistent with an outcomes-based regulatory framework, rather than heavily prescriptive. It was noted that a move to a Total Factor Productivity (TFP) approach to economic regulation, which is currently being considered by the Australian Energy Market Commission, may incentivise electricity distributors to make a paradigm shift in the way they operate. However it is unclear if such a shift would lead to or facilitate a reduction in fire risk. 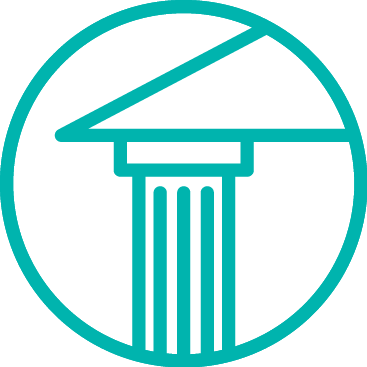 VBRC processes have placed in the public domain a wide range of information in the form of evidence and submissions. 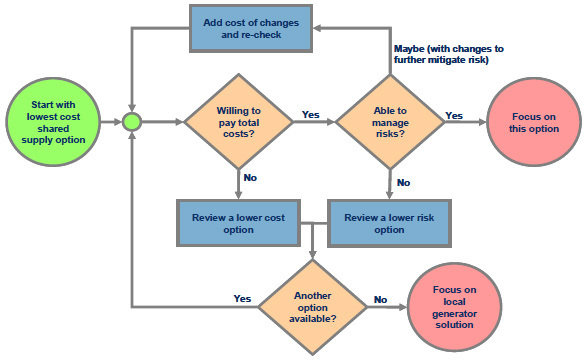 Whilst these processes effectively address the 'what happened and why' question, more work is necessary to gather the mass of quantitative data required for reliable analysis and identification of options that will most cost-effectively deliver a step change reduction in fire risk from electricity network assets. Comparative local benefit/cost/risk profiles of Victoria's communities and regions. Potential benefits and risks of new technologies, including those new to Victoria. More detailed specification of these information requirements is set out in the following sections. Cost data certainty: Cost estimates provided for network replacement options remain very uncertain. Estimates provided in the workshop information paper are high level and indicative only; they are derived from a small number of confidential and public sources and have an estimated accuracy of only ±30-40%. Estimates from other jurisdictions differ from these estimates and from each other. Option selection requires a better understanding of the effects of underlying assumptions on these cost estimates. Also, the estimates do not yet encompass the potential benefits of techniques like underground cable plough-in. Line lengths used in initial cost estimation are also approximate. Victoria's major rural distributors own substantial urban networks and manage their total networks (urban and rural) as integrated facilities. Whilst current line lengths are accurately known, line lengths for a new network based on different technology can only be estimated. The accuracy of line length estimation techniques should be better understood before major reliance is placed on them. Cost estimates in VBRC evidence and submissions also differ widely in their underlying assumptions. Some expert evidence in VBRC proceedings (e.g. on the service life and supply reliability benefits of underground cable and ABC options10) is at first glance in conflict with published data. Any material discrepancies must be resolved if data used for option selection is to be defensible as 'fit for purpose'. Financial effects on customers: The modelling of future electricity accounts set out in the workshop information paper (Appendix C) used preliminary high level estimates of factors such as route length extension and overhead costs as well as a number of simplifying assumptions. These initial estimates and assumptions must be tested and confirmed in more detailed studies before results can be relied upon for major decisions. More accurate cost data, at least for short listed options, will be essential and each of these areas of necessary data refinement must be addressed. 10 The costs and benefits of undergrounding of electricity supply cables has previously been the subject of major published studies in Australia (DoCITA 1997) and in many US states including Virginia (2005) and Florida (2007) and by authoritative institutions such as the Edison Electric Institute (2004). It is not clear that VRBC evidence on underground cable options refers to modern XLPE cable technology. The service life of XLPE underground cables is significantly shorter (up to 30-50% less) than that of overhead bare wire power lines. Realistic network undergrounding options are partial only; only line spans are placed underground while many poles supporting equipment and tee-off connections remain. ABC and covered conductor options require the same vegetation clearance activity as bare wire lines but the dimensions of the clearance space are reduced somewhat so environmental and visual impacts are also reduced. Undergrounding requires extensive temporary vegetation clearance for installation and end-of-life replacement11, which can create visible short term disruption to the landscape. 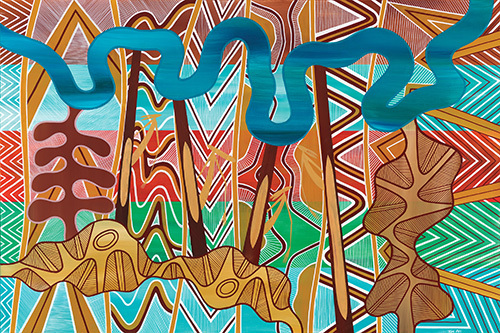 Effective visual communications material will be essential for community engagement on the potential visual amenity effects of options on Victoria's rural landscapes. Better information on non-network alternatives such as RAPS will be required, especially given the likely comparative advantage these options may have over network based options in some circumstances where remote and widely dispersed small loads are to be supplied in very high risk situations. In such circumstances, some consumers may prefer RAPS solutions. The benefits, costs and risks of non-network options have only been briefly explored at a high level in the information paper (Appendix C, Section 4.4). RAPS case studies have been published by equipment suppliers, government renewable energy programs and public advocacy groups. These studies generally deal with single customer installations and rarely provide the sort of comprehensive long term data on cost, risk and performance that will be required for incorporation of these options as broader strategy elements in the current analysis challenge. Selection of non-network options is today done by single customers under the normal buyer's caveat emptor. Wider consideration of such options as part of an end-to-end fire risk management strategy for whole regions will likely create demand for auditability and peer review of pertinent data and a better understanding of their safety and reliability implications. To properly assess non-network options, reliable long term data will be required for sound estimation of potential benefits, costs and risks that may flow from their strategic adoption in rural areas. 11 Typically, undergrounding requires clearance of vegetation in a 10 metre wide path to allow heavy vehicle access. Factors along the causation chain shown in Section 2.1 above, e.g. vegetation type and propensity to low moisture content, emergency response capability, existence of safer places and barriers to fire movement towards property and population, ease and security of access. Sensitivity to potential outcomes such as visual amenity impacts and economic effects of higher electricity prices. 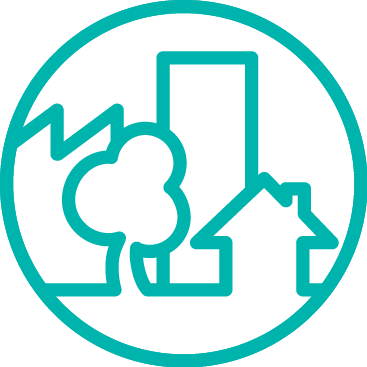 Recent work by the Victorian Government to identify 'at-risk communities' may have at least partially addressed this need and this work should be adapted and extended to support analysis of fire risk reduction options. Value of reductions in energy release: The relationship between energy release into the environment from electricity assets and ignition of vegetation12 is not well understood in quantitative terms. This constrains analysis of the many options designed to reduce energy release, e.g. auto-reclose suppression, new SWER protection and control systems and fault current limitation technologies. To be valid, comparison of such options depends on a model of vegetation ignition by electrical energy release that is capable of supporting quantitative estimation of fire risk. Such a model was not identified in preparation of the workshop information paper and VBRC evidence13 on the origins of the Kilmore East fire indicated the complexity of the issues involved. Estimates of fire start incidence reductions: The reductions in electricity asset fire starts that might be delivered by a particular option, e.g. will undergrounding of lines (equipment remaining on poles) reduce fire starts by 50% or 90% or by some other amount? Would any reduction result from moving to a three year inspection cycle? From upgrading SWER to modern Aluminium clad conductor? Offsetting risk increases: Some options produce new potential risks and may increase others. 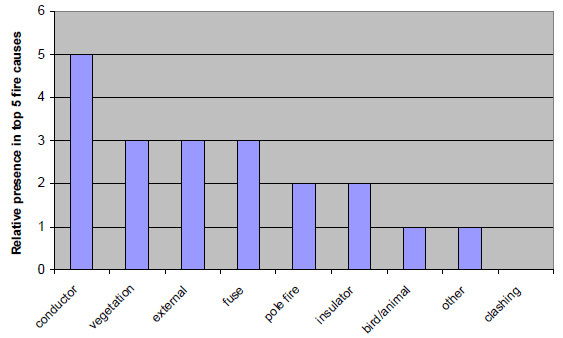 For example, some potential causes of fire starts are largely absent in the current situation, e.g. fires from failure of cable terminations, though they could be introduced by an option under consideration, such as undergrounding. Others are relatively small at present, but could become more significant if the selected option changes the mix of technology on the network, e.g. a major increase in surge diverters due to the requirement to protect cables from lightning damage. Data on new fire causes is not available from analysis of historical statistics. Reliable analysis of options will require these additional risks be identified and estimated. 12 Section 6.3.2 of the workshop information paper (Appendix C) outlines the importance of this key data to sound assessment of strategy options. Reliable information on the views and relative priorities of rural communities and other key stakeholders is required but not currently available. It is unrealistic to assume that any decision can proceed to implementation without community engagement to gather this information and factor it into decisions. The VBRC has consulted widely with communities affected by the Black Saturday fires. Considering the 2009 fires together with earlier fires in which electricity assets were involved in1977 and 1983 it is possible (indeed probable) that future major fire outbreaks could involve quite different communities and different factors. A broad systematic approach to community engagement and the gathering of data on community priorities and attitudes is essential if decisions are to cover future needs. Stakeholders commented in workshop discussions that current media coverage may not accurately reflect the feeling in many towns with a vital interest in the issue. Further, the views and interests of farmers and other energy users with strong dependence on reliable affordable power supply may have been only lightly addressed in current processes. What is the willingness of communities to pay for reduced risk of electricity system assets starting future fires? What relative priorities do communities place on risk reduction investments across the full range of intervention (shown on the causation chain in Figure 6 on page 11 above) noting the major presence of other fire causes not related to electricity system assets? To what extent are communities and consumers willing to trade off reliability of electricity supply against fire risk reduction? Similarly, to what extent are they prepared to accept visual amenity effects of options? It is difficult to see how any option could be successfully implemented unless it is based on widely recognised answers to these key questions. Careful thought must be given to the best means of addressing this threshold issue and gathering the required data. The potential of enhanced protection and control systems and smart grid concepts to reduce fire risk is not clear, though these offer clear promise to reduce energy release when faults occur and to allow adjustment of network performance characteristics in response to variations in fire risk levels. Initial consideration of these options has been plagued by complexity, as well as diversity of inter-dependent factors and effects that extend into other areas. It is difficult to decouple consideration of these strategies from the full range of considerations in fire risk management. If auto-reclose is suppressed or constrained, a line de-energised by a protection system operation cannot be safely re-energised without a visual inspection. This requires a patrol of the length of the line by electricity company staff or specialist contractors. Re-energisation may be important to local fire preparedness and fire management. On days of extreme fire risk, freedom of movement is often limited and a patrol may not be possible even if a decision to proceed were made. If community interests were at stake, this could present the operations manager with a very difficult decision. As in many other examples, consideration of protection and control strategy options rapidly extends into overall emergency management and community needs in extreme circumstances. One key element of any protection and control strategy is communications infrastructure to link pole-mounted equipment to central control facilities. Infrastructure options are undergoing rapid evolution and the long term future in this key area is not fully clear. Protection and control system options and potential 'smart grid' concepts must be separately modelled to map the issues, converge to core considerations and more clearly define the net value offered by these options. Though presently unclear, this value may be very high and investment in serious investigation, modelling and even pilot projects would appear to be warranted. Some communities rely on pumped water which in turn relies on power supply. The water supply system normally has a storage buffer (reservoir), however the capacity/duration of this can vary. Communities affected by the Black Saturday fires relied heavily on mobile phone communications as most people faced with emergencies do today. Experience with lengthy electricity supply interruptions in Melbourne in early 2007 revealed that mobile phone base stations often have back-up battery power for only about 60-90 minutes operation. There is little data on the effect of loss of mobile phone communications on fire management. Of course, communication facilities can still be destroyed by the fire itself even if not disabled by loss of power supply. Petrol stations require electricity to pump fuel for emergency vehicles but generally have no back up supplies. Hospitals generally have back-up generators. 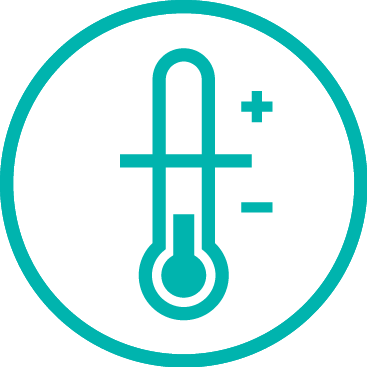 Individuals at risk of heat death (the very old and the very young) often do not have any back-up supplies in their homes. All these considerations apply to people staying to defend their properties. Consideration of this issue must also take into account the intent of people to relocate as a means of reducing fire risk to life. Supply reliability is less of a priority if people are not present15. Local 'ride through' capacity using local generators or battery storage is also potentially important, but raises the issue of 'island networks' fed from such sources. If local generation keeps the local distribution network alive it is valid to then ask: is risk reduced on a holistic basis? In such cases, new safety risks may arise. Supply restoration delays after fires can affect public health and important services like food storage. 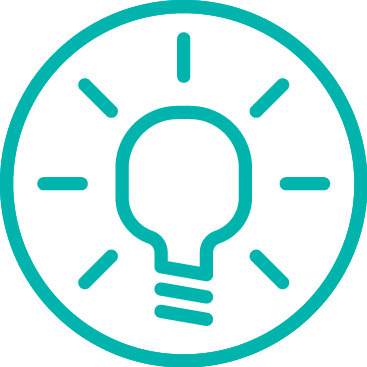 Bare wire networks are often quickly re-energised after a fire has passed except when insulators have been destroyed or poles and cross-arms burned away16. Network options based on covered or insulated conductors such as ABC can be very vulnerable to fires -restoration of power supply can take an extended period while the network is replaced. Underground cable networks are affected by fires since cable terminations are generally above ground and vulnerable. Heat damage can extend below ground and cable testing and possible cable replacement may be required, which can take an extended period. Cable termination repair and cable jointing both require specialist skills. A fuller understanding of both aspects – the importance of electricity supply to fire preparedness and management and the potential impacts of extended supply restoration periods -is essential for proper evaluation of options. Benchmarking (national and international) information on rural electricity distribution would provide valuable context and support for analysis of options. This type of data has not yet been gathered, apart from the initial high level national survey summarised in Appendix B. Some options involve major extended capital works programs which cannot be assessed without modelling availability of critical skills, e.g. cable jointing skills for undergrounding options. Constraints on skill availability could materially increase costs and significantly delay implementation. Modelling to estimate these impacts has not yet been carried out. Reliable data on the potential benefits and risks of options based on technology not yet in widespread use17 must be determined. This may require selective R&D projects and pilots. 14 One other jurisdiction has done extensive risk analysis on this matter and adopted formal policy that auto-reclose is not to be suppressed on total fire ban days as it would increases overall risk. 15 One jurisdiction reports consideration of arrangements for catastrophic fire danger days, whereby communities at risk relocate and the network is de-energised. These two aspects are a packaged risk reduction option that cannot be unbundled. 16 One jurisdiction reported on experiments with fire resistant paint indicates that even wooden poles can be protected – they generally burn from the ground up and use of fire retardant paint on the lower two metres achieves major damage reduction. 17 This may include technology other than electricity distribution technology, e.g. the trial of remote automatic sensing of fire starts now underway with scanners on Mount Porndon, Crows Lookout, Peters Hill and Mount Cowley in South West Victoria. Each of these focus areas is described in the following sections. Given the projected effects of climate change, the objective is to stabilise the risk or to reduce it despite climate change. 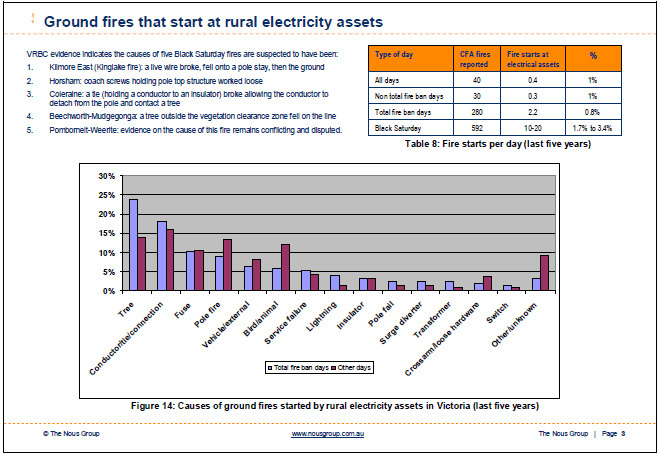 Reducing fires started by electricity assets (e.g. 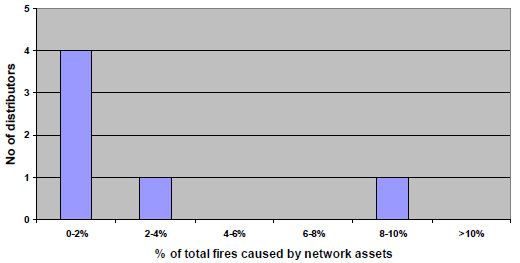 from less than 4% to less than 0.4% or 1%) and reducing the more than 96% of fires started by other causes. Any regulatory approach, including the 'outcomes based' safety regulatory approach that applies to the Victorian electricity distributors, is dependent on clearly articulated objectives and targeted outcomes. In the absence of this information, there may be little reduction in the risk that electricity assets start fires despite significant investment, or there may be a reduction in the risk that electricity assets start fires but an increase in risk elsewhere. The community's expectations on the need to reduce the risk of fires starting from electricity system assets must be gauged – a view expressed by workshop participants was that communities may simply want more information on fire starts from electricity system assets rather than a large investment. The extent to which customers would prefer a remote area power supply option rather than a grid connected supply18. The community representatives at the workshop indicated that electricity consumers, particularly vulnerable customers and businesses, are already struggling with anticipated increases in electricity prices due to other factors (e.g. carbon pricing) and would not be able to afford the projected further increases. It was noted that fires can travel across boundaries of electricity distributor territories and that major fires impact on the community and economy more broadly. For those reasons it was suggested that consideration be given to how the costs to reduce the risk of fire starts from electricity assets are best allocated. The information paper includes cost estimates for some network replacement options. 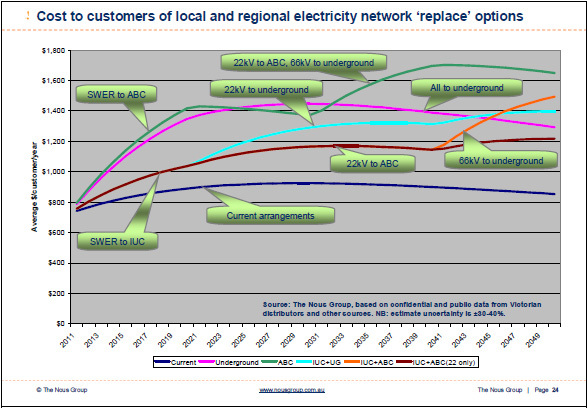 Many assumptions and averages were used in deriving these estimates and uncertainty levels remain undesirably high, particularly for technologies currently not in use in Victoria, such as covered/insulated conductor options. Some promising new technologies, e.g. ploughing in underground cables, have not yet been incorporated in the estimates. Better cost information for network and non-network options is a high priority requirement to inform early community engagement activity. The variety of community circumstances across Victoria must be mapped to identify locations with common requirements and to identify the highest risk areas for early action. This will allow a portfolio of options to be optimised by location. This information is best presented on a map of Victoria for ease of communication. Factors that determine costs of solution options (soil and vegetation, terrain, etc.). 18 It is likely that RAPS for individual customers may cut cost and risk in specific circumstances. However, RAPS is not a community level option – it does not reduce risk if it uses the same network technology used by distributors today. The workshop commenced a process of disclosure between different groups of stakeholders. Participants recognised the need for continued collaboration to deal with the complexity of the issues. For efficiency, this collaboration should be based on principles of transparency and free information sharing. Information sharing by distributors: Representatives from the Energy Networks Association (ENA) were able to provide the workshop with information on practices used by some inter-state electricity distributors to reduce the risk of electricity system assets starting fires. However, during discussion it was evident that there was further valuable information that should be obtained. After the workshop the ENA issued a survey to all Australian electricity distributors seeking this information and responses are summarised in Appendix B. Three way collaboration: Collaboration between regulators (AER and ESV), electricity distributors and the community is seen by some stakeholders as important to success. Collaboration between the two regulators has recently been enhanced with the signing of a Memorandum of Understanding. Rather than greater collaboration activity, the primary requirement of stakeholders may be for greater transparency of regulatory processes. ESV referred to the proposed new annual report that they will publish which may move some way towards the desired level of transparency. 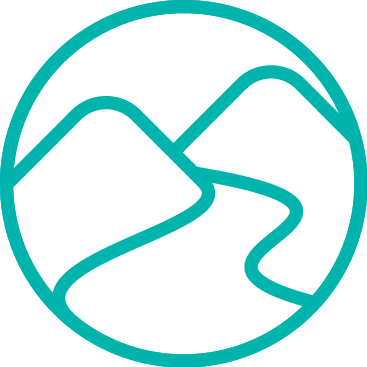 Engagement with communities: It was suggested that existing community processes and leaders be used, with a clear delineation between consultation and information sharing. See Section 3 above for more detail on this requirement. Electricity and fire services: The electricity distributors and fire authorities have already strengthened their joint emergency management processes. Further collaboration will be required to ensure electricity distribution solutions yield maximum risk reduction benefits. Structured R&D investment is likely to be required to develop and pilot the most promising options and any new technologies required for their successful deployment. Given the estimated high cost of network replacement options, there is an imperative to undertake R&D and trials of alternative technologies that could reduce the risk of electricity system assets starting fires at a much lower cost. It is understood that some R&D is being undertaken by distributors and further information is required on this. Suitability of IUC and high voltage ABC for Victorian conditions. Experience with these technologies is limited, especially in Victoria. They potentially offer a promise of reduced fire risk from interference of vegetation with power lines. Cable undergrounding by plough. This technique potentially offers a major reduction in the cost of undergrounding high voltage lines. It is being trialled in one other jurisdiction. Enhanced protection systems for SWER networks. These potentially offer reductions in energy release into the environment with potential reductions in risk of ignition. Ground fault neutralisers and other systems for limiting energy release from non-SWER networks. These technologies are in use in most jurisdictions but their potential benefits in fire risk reduction have not been fully assessed. Candidates for more basic or 'pure' R&D are not yet obvious and a scan of relevant technology areas will be required to identify them. To ensure results are aligned with overall goals, the R&D program should be structured and guided by the usual 'stage-gate' R&D management processes. A discussion ensued as to whether the current regulatory framework adequately provided for R&D expenditure. It was noted that the electricity distributors are provided with approval to raise an amount of money and they are free to spend it as they choose, including on R&D activity. Without a formal obligation to undertake specific R&D, there is no assurance that the specific R&D will be undertaken. Victoria's Minister for Energy and Resources has asked ESV to establish a process to take the work of this workshop report forward. ESV is aiming to move quickly to a feasible range of options to minimise bushfire starts related to electricity network assets and will be undertaking a range of analyses, including desk studies, technology reviews and trials. 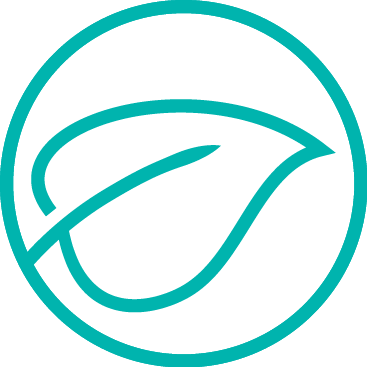 In undertaking its review, ESV will adopt a cooperative collaborative approach, including the establishment of a broadly based advisory committee. ESV will produce an Interim Report by 30 November 2010 and a final report by 1 November 2011. ESV's Director of Energy Safety outlined to the workshop the steps planned to establish suitable resources for work to commence as soon as possible. A full work plan is to be provided to the Minister by end of July 2010. The workshop report will provide a valuable basis for the ESV work and will be provided also to the VBRC to assist its deliberations as the Commissioners prepare their final report. The 16 workshop recommendations summarised in Table 6 cover frameworks, processes, information and areas of short term focus. Details and context for each recommendation are provided in the body of the report at the page number shown19. 19 These should be reviewed to ensure correct understanding before any reliance is placed upon the recommendation summary wording set out here. 20 Attended for part of the workshop. The Energy Networks Association sponsored a quick national survey of its members to provide additional context information to assist thinking on Victoria's management of fire risk from electrical assets. The survey instrument shown in Section B.5 below was sent to all Australian electricity distributors. Responses were collated to provide the high level overview set out here. Eight owners of Australia's rural electricity networks responded to the survey. Responses included representation of all states and all major distributors with networks in high fire risk areas. 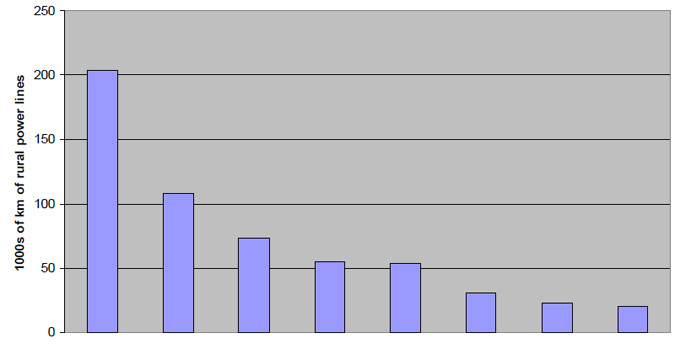 Respondents' networks vary in size over a ten to one range as indicated in Figure 15. The survey responses cover networks with about 600,000km of rural power lines, i.e. nearly seven times the total length (84,000km) of all Victoria's rural power lines. Across the jurisdictions covered by the survey, fire risk is generally graded. Granularity of the grades used ranges from two (high, low) to four (extreme, high, moderate, low). Classification of fire risk areas is generally done by parties other than the distributor and is often given statutory force (through license condition, statutory regulation or legislation). 60% of the total rural line length covered by the survey is in fire risk zones. Five respondents have rural networks that are 100% in graded fire risk areas, one has 75% of its network in such areas and the other two have less than 10% - the lowest is 0.6%. 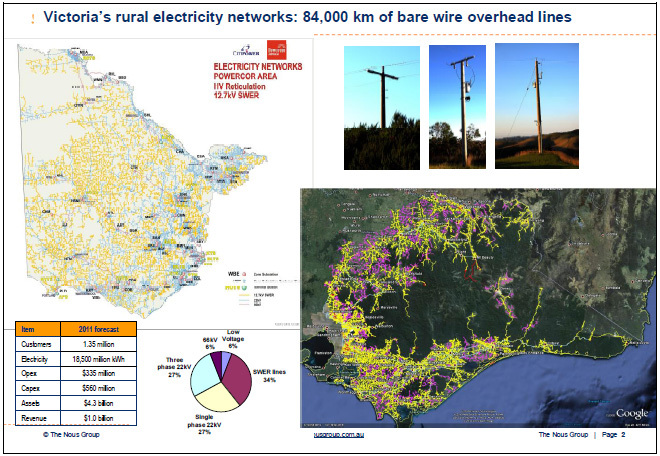 Victoria's rural networks broadly reflect the national use of different power line technologies, as shown in Figure 16, with slightly lower presence of sub-transmission and low voltage. 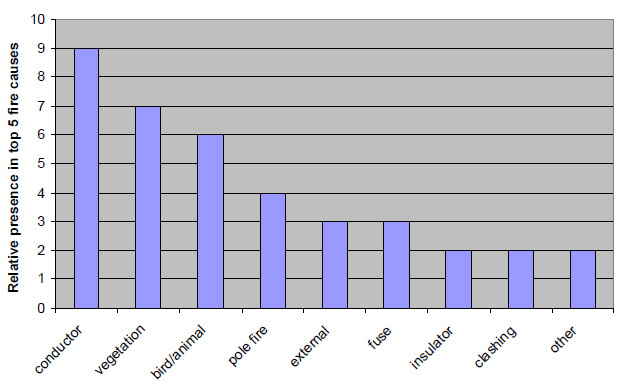 Figure 17 shows that at high voltage levels, alternatives to bare wire (insulated lines and underground cables) are much less common (4%) than at low voltage levels (36%). Based on the data gathered in the survey, Victoria's rate of fire starts from rural electricity networks appears to be not unusual when compared with other jurisdictions. However, this measure (fire starts from electricity assets as a proportion of total fire starts) is not tracked in a nationally consistent way and not tracked at all in some jurisdictions. Victoria's methods of measurement could be expected to result in higher figures than some other jurisdictions, e.g. where distributors count only those fires actually attended by fire services. An anomalously high rate was reported by a single respondent in a region with low fire risk. Fire cause patterns are broadly similar across Australia's rural networks, with only a couple of exceptions (some non-Victorian networks experience higher levels of fires from conductor clashing and failures of conductor connections than seen in Victoria). 21 The national split of technologies shown excludes one outlier, i.e. it is based on seven of the eight responses. Also, because of higher soil resistivity, one major distributor has around 40,000km of a two-wire variant of SWER where the second wire is a return path for current that would normally flow through the ground. From a protection system point of view, this technology is similar to SWER. However, unlike single wire SWER, conductor clashing risk must be managed. The data on this variant has been included in the national data for SWER. Victoria's rural networks use protection and control systems equal to best practice in Australia. Victoria's rural feeder auto-reclose practices are typical of national practice or if anything, slightly more conservative (single reclose is common at Victorian substations) than in most other networks. Over-current and earth fault protection: All distributors use over-current and earth fault protection located at the source substation to cover all rural high voltage lines. A variety of design philosophies is used in setting these systems, with two approaches22 in particular used by a number of distributors. Some distributors optimise protection for maximum coverage of back-up systems that will de-energise the feeder if the normal primary protection fails to achieve this. Protection settings are not generally easy to temporarily change in response to fire risk levels in the area. Sensitive earth fault protection: Most distributors (including both Victorian distributors) also use sensitive earth fault protection in source substations. This type deenergises feeders for low current faults such as a tree touching the line and hence is of particular relevance to fire risk reduction. Typical settings trip the feeder within 5-10 seconds for fault currents around 5-10 amps. One major distributor does not use this class of protection and another is about 60% through a roll-out to its rural network. Auto-reclose systems: All distributors use auto-reclose systems on rural feeders at the source substation. Many are set for multiple recloses and the precise mix of fast and slower clearance times often varies depending on the particular feeder. Remote control: Most distributors have completed (and others are part way through) a roll-out of remote control to all rural substations. Typically, the remote control facility allows auto-reclose settings to be remotely changed, but not protection system settings. Protection systems with similarly comprehensive capability to those in the source substation are spread along the length of many rural feeders, i.e. pole-mounted systems provide over-current, earth fault, sensitive earth fault protection and multiple auto-reclose capability to clear transient faults. Most distributors are progressively rolling out remote control to these devices, with some expected to reach 100% coverage within the next few years. The remote control can switch the device and constrain or suppress auto-reclose functions. Earth fault protection of SWER systems is not possible due to the presence of earth current in normal operation. At the point where a local SWER network takes power from the normal (non-SWER) high voltage network, a SWER isolation transformer is always installed. The protection arrangements at this point determine the behaviour of the whole SWER network fed from that point. Many distributors have an older style OCR or a modern ACR at this location to enhance service reliability by auto-reclosing after transient faults and to improve protection coordination along the length of the lines so fuses closer to a fault will blow first, allowing the remainder of the network to continue supplying customers. The presence of remote control of these devices varies widely between distributors with one major distributor close to 100%, a number at 0% and others in between these extremes. It is not clear that all distributors intend to roll-out remote control to these devices, possibly because of lack of local wide area communications infrastructure. Some distributors do not use OCRs or ACRs at SWER take-off points -they use fuses instead, so auto-reclose and remote control is not possible. 22 Feeders set to trip at twice maximum expected load current; feeders set to trip at half the minimum fault current, i.e. half the current that would occur for a fault at the far end of the protected section of line. Most distributors that operate rural electricity networks in bushfire prone areas (including those in Victoria) have long-standing policies that temporarily constrain or disable the operation of auto-reclose on days of heightened fire risk. To the extent they are described in responses, there are few similarities apparent in these policies. No respondents change auto-reclose settings for the whole fire season – one respondent described the potential result of doing this as 'an operational nightmare'. Asset inspection cycles used in Victoria are broadly typical of national practice. Victoria's distributors use shorter cycles in special circumstances. A few others use shorter cycles more widely. 23 All distributors have multiple cycles for different classes of assets and different risk levels. The long (ten year) cycle shown is for concrete poles which do not experience the degradation mechanisms of wooden structures. Some other technologies and a diverse range of network operations and asset management approaches are potentially or directly relevant to fire risk management. Neutral earthing resistors and other devices such as ground fault neutralisers that limit fault currents are used by a number of distributors, but not by all – and most have them installed on only a minority of substations. One respondent reported that these technologies had been investigated, but a decision had been made to not adopt them. It was beyond the scope of this initial survey to review more detail on current practices. Where these technologies are in use, their presence appears to be primarily driven by a requirement to limit high fault currents to levels that can be safely interrupted and which do not damage network assets when faults occur. Fire risk reduction is a secondary consideration. A number of these practices are reflected in respondents' advice of practices in other jurisdictions. There were few practices in other jurisdictions that have not been adopted in Victoria, except perhaps a procedure in one jurisdiction for disconnection (in conjunction with fire agencies) of selected whole feeders on extreme risk days. Sophisticated inspection technologies (unmanned aerial vehicles, remote cameras, high definition photography, satellite profiling, aerial imaging - visible and thermal, light detection and ranging [LIDAR], pole mounted cameras, non invasive pole testing technologies). Initiatives embedded in 'business as usual' asset replacement programs, as these generally involve replacement of old technology with newer equipment that provides potential for lower fire risk and remote control. Typical examples include the replacement of pole-mounted air-break switches with fully enclosed switch technology and the replacement of older electromechanical protection relays with more sophisticated remotely controllable digital types. Ongoing work to build closer relationships between distributors and fire management agencies. Enhanced asset management approaches that combine conditioning monitoring and asset age based decision criteria. A trial of underground cable plough-in technology to reduce cost of undergrounding power lines.